In the last years, pollutant and noise emissions reduction has become a priority for local authorities, not only for what it concerns “urban background noise” (traffic) but also for what it concerns “additional” emission and noise related to temporary events and construction sites. Environmental noise affects a large number of Europeans and the general audience perceives it as one of the major environmental problems Since environmental noise is persistent and inescapable, a significant proportion of the population is exposed to it (75% of EU citizens live in cities). The EU Green Paper Future Noise Policy states that around 20 % of the EU’s population suffer from noise levels that health experts consider to be unacceptable, i.e. which can lead to annoyance, sleep disturbance and adverse health effects. 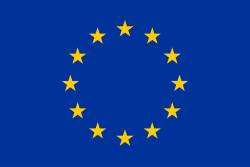 At the same time Regulation (EU) 2016/1628 of September 2016 on requirements relating to gaseous and particulate pollutant emission limits for internal combustion engines for non-road mobile machinery, sets up lower threshold for pollutant emissions that will oblige a turnover in the current temporary gensets fleet dominated by Diesel In this framework, FC Gensets can become a turnkey technology proposing a zero emission/zero noise reliable power supply to be used in in hostile environments such as construction sites potentially also bringing higher flexibility in their work scheduling (nigh-time) and to avoid bothering noise during music festivals and temporary events. Starting from already on the market Fuel Cell stacks (PCS S2 and S3 stacks) provided by Power Cell Systems, in the EVERYWH2ERE project 8 gensets with two power capacity sizes will be developed: 4×25 kW and 4×100 kW, involving different Consortium partners as reported in Table below. The 25 kW genset will be be based on the PCS S2 Stack: PowerCell has used its heritage from the automotive industry to launch a fuel cell stack that will meet both stationary and mobile requirements in its power range. PowerCell S2 fuel cell stack is designed for efficient power generation in the range of 5 to 25kW with State-of-the-art PEM technology for superior performance in many applications. PowerCell S2 is optimized to run on reformate gas but performs equally well on pure hydrogen. In the EVERYWH2ERE project PCS will integrate this stack in an updated version of the prototype system for mobile applications MS-20. The MS-20 has successfully been tested in a light truck and in a passenger car. Currently the same hardware is integrated in a heavy fork lift. The MS-20 is based on a 250 cell S2-stack. 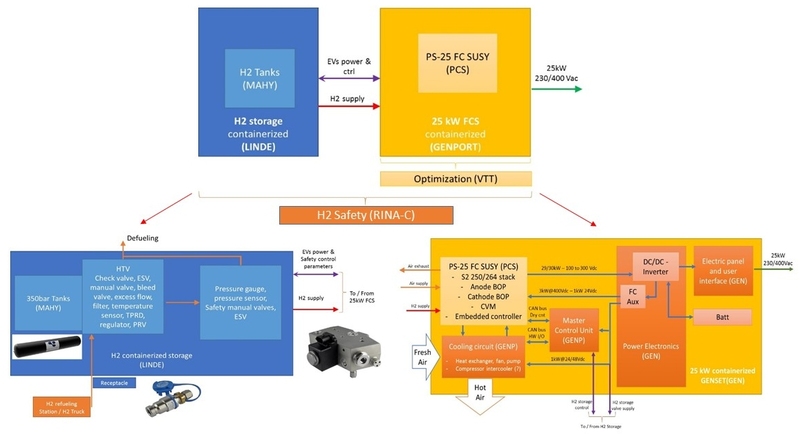 In order to increase power output of the PCS stack,but reducing the CAPEX of the system, VTT is proposing an ejector solution to be applied to the 25 kW EVERYWH2ERE genset. In PEMFC systems anode gas recirculation is utilized for humidifying the otherwise dry anode inlet gas. Another important function of anode gas recirculation is to increase gas velocity in the stack, which then prevents liquid water build-up and blockage of catalyst sites. Anode gas recirculation is achieved either with a mechanical pump or with an ejector. Recently ejectors have received an increasing attention because their durability, cost, and energy efficiency are superior compared to mechanical pumps. The 100 kW genset will be be based on the PCS S3 which is designed to efficiently operate (>52%) in the power generation range 20-100 kW. The durability was predicted at least 5000 hours at a dynamic load and road profile, including automotive start/stop profiles and at a coolant temperature of 70°C (inlet) and 80°C (outlet). The system shall be able to operate in freezing conditions capable down to -20 °C. This will be reached by a combination of shut-down and start-up procedures and some local electric heating (mainly end cell heater, anode drain system heater). The system efficiency (from Hydrogen in to DC out) shall be above 50% at begin of life (BOL) since the cell voltage shall be at 0.72V under full load operation and the compressor power below 10 kW thanks to the use of the expander.. The controller is a free programmable automotive ECU. A hardwired safety loop will safely shutdown the system in the case of a major malfunction of the controller. The air filter used for automotive applications can also be used for the transportable gensets. Automotive components will be used wherever possible in order to improve the system reliability and to reduce the BOP cost. 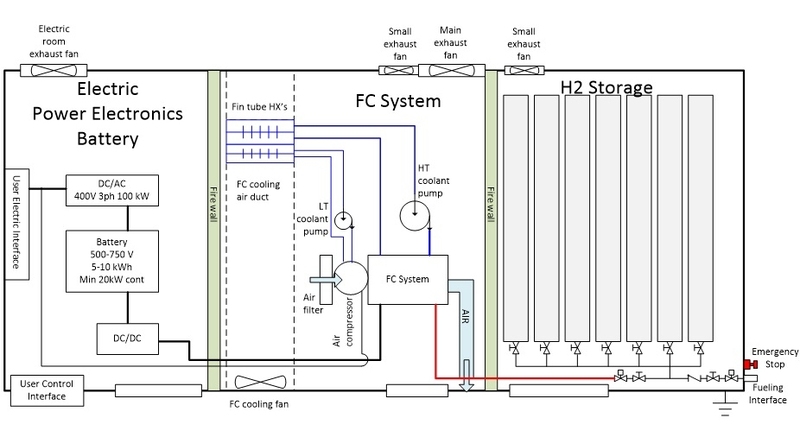 In order to have a robust and easy to install solution, the fuel cell system and the hydrogen storage will be installed in one single 20 ft container (6,00×2,35×2,39 m). This will enable the system to be transported and installed while keeping all electrical and gas connections already present.